: Is used for rabbit hunting, and to that end, adapts perfectly to the many irregularities of the terrain by using his prodigious nose, his sight and hearing. He endures easily high temperatures and is capable of hunting from dawn to nightfall. He is mainly a tracker dog who must neither bark nor catch the game during his scenting work. Is also used in hunting, combined with the ferret, method of hunting authorised on the islands. He usually takes the rabbits in his mouth. : On the Canary Islands, from where he originates, he is known under the name of Podenco Canario. We meet him frequently on all the islands, especially on the biggest, on the Gran Canary Island and the Isle of Teneriffe. 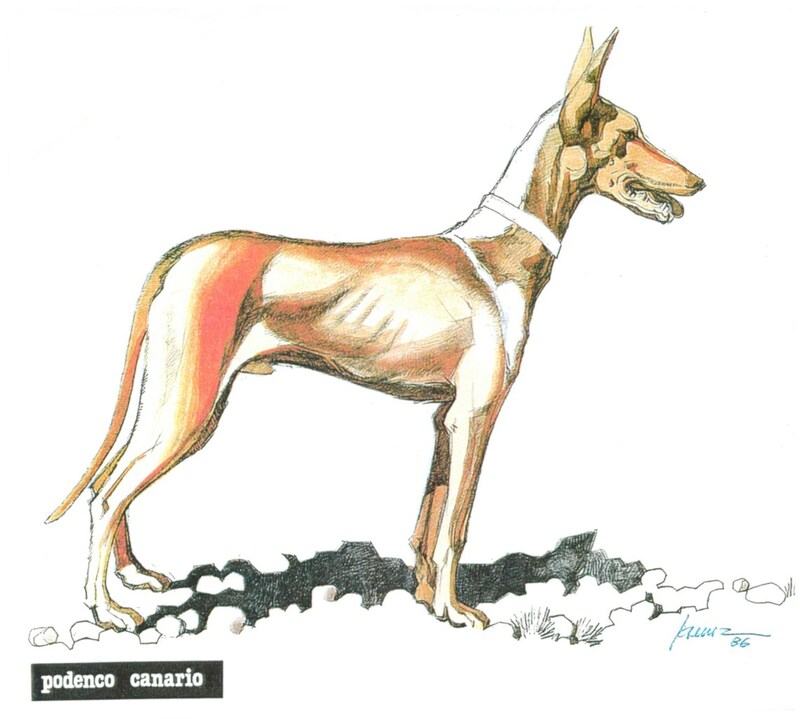 The Podenco Canario is a dog of Egyptian origin which was probably imported to the Canary Islands by the Phoenicians, the Greeks, the Carthaginians and the Egyptians themselves. It is one of the most ancient breeds in existence, because we find numerous vestiges (engravings, statues, bas-reliefs) in the tombs of the Pharaohs and in the museums of the Louvre or the British Museum. This breed dates back about seven thousand years. His extraordinary survival is no doubt due to his gifts as a hunter which have made him irreplaceable during the centuries. Thanks to his nose and his hearing, he can also detect the presence of rabbits at the bottom of natural crevices of the terrain, in cracks in walls, in the heaps of stones at the edges of ploughed fields, in the volcanic tubes and in the thorny bushes. : It is a dog of medium size, built on longish lines, slender, light and extremely resistant. The skeleton is well developed. The absence of layers of fat make it possible to see the rib cage as well as the spinal column and the hip bones. The musculature is developed to the highest degree, lean, the contractions of the muscles are visible through the skin. : Sligthly longer than high. Chest well developed without coming down to the elbow. Muzzle slightly longer than the skull. : Courageous, nervy, agitated, and of an enthusiastic dynamism. Imposing but not at all aggressive. Attached with abnegation to his master, he stoically puts up with the most rigorous days without the least sign of fatigue. : Elongated, truncated cone shape, well in proportion with the body, of medium length of 21 to 22 cm. The cranial-facial axes are parallel. : Longer than wide, flat, with the occipital crest prominent. : Large, flesh-coloured in harmony with the colour of the coat. Nostrils moderately open. : Large and prominent, in shape of a blunt cone, more or less dark flesh colour in harmony with the coat. : Fine and tight, of a colour in harmony with the nose. : Scissor bite, teeth adapting perfectly, well developed. : Oblique, small, almond-shaped. More or less dark amber in colour; the intensity depends on the colour of the coat. The expression is intelligent and full of nobleness. : Quite big, they rise up when the dog is in a state of excitation and are pricked in a slightly divergent position. At rest, they tip backwards. They are broad at their set on, ending in a point. : Well muscled, straight, with smooth skin and without dewlap, flexible and rounded. : Strong, musculature well developed, fit for the racing and the demands of the hunt. : Bones of the rump quite solid, more visible in the thin subjects or in full hunting season. : The sternum is not protruding. Chest well developed, yet does not come down to the elbow. Ribs oval. The thoracic perimeter exceeds the height at the withers by 5 to 8 cm. : Drawn up, without being as whippety as the Galgo. Flanks well marked. : Rather low set, appears as an extension of the rump. Round, reaches only a little lower than the hock. Hanging, or raised in sickle shape. A little tapered at the tip, which is usually white. Is never rolled up. It is not desirable it be carried too high when moving. : Perfectly vertical, straight and parallel; bone structure fine but solid; Angulations: Scapula-humeral angle about 110°. Humeral-radial angle about 140°. : Feet in shape of cat-feet, generally slightly turned outwards. Pads firm, slightly oval. : Cat-feet really straight, pads firm and oval shaped. : Well vertical, straight, robust; musculature well developed. Angulations: Coxal-femoral angle about 110°. Femoral-tibial angle about 120°. Angle of the hock about 130°. : Hock quite high (about 18 cm from the ground). : The trot must be agile, extended and very light. : Firm, adheres without folds to the body. : Smooth, short and dense. : Preferably red and white, the red may be more or less intense, going from orange to dark red (mahogany). All combinations of these colours. For males from 55 to 64 cm, for females from 53 to 60 cm. Crossing of the fore and hindlegs at the walk.